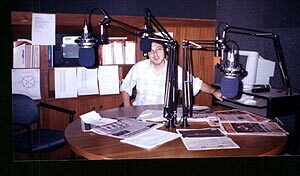 Radio 1630 AM is among the strongest Argentinian X-band stations, and I was lucky to be able to listen to it for almost an hour in April 2000. Just before sunrise, the signal was surprisingly clear and stable, although I was using a modest 50-meter-long wire antenna. Playing international hits, the station identified frequently as Red 92 and 1630 AM, also mentioning the slogan Buen Aire. The legal status of the station is a bit unclear; the station doesn't have call letters, which would suggest that it is unauthorized - as is the case with most if not all Argentinian X-band stations. However, the station claims to have broadcasting licenses for both FM - which they have been using for a decade - and also AM, which they say they have acquired recently. Nevertheless, in Argentina the legal status doesn't seem to matter very much nowadays. Many unofficial Argentinian stations don't reply to international mail, partly because they don't want to make a fuss about their existence. Radio 1630 AM was, and hopefully still is, different. Already in May I received a friendly email reply from Technical Director Juan Marcelo Escande, who enclosed an eQSL. The station employs some 40 people (including both AM and FM personnel), Escande explains. It seems that the same feed is broadcast both on AM and FM. 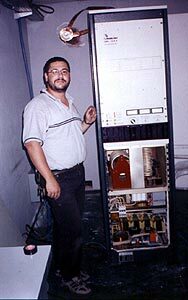 The transmitter power according to Escande is 5 kW, although WRTH 2002 puts it at 25 kW, which may indicate an upgrade. Personally I think that the signal has become weaker and I don't remember hearing the station anymore for a very long time. AM 1630 has a website made by Flash software - so no access unless you have Flash Player 5 or newer. A typical Flash site with lots of annoying sound effects - but fortunately also useful data such as contact information (Av. Circunvalación 32 e/ 3 y 4), email and frequencies, which in addition to 1630 kHz include four FM frequencies and surprisingly also 1480 AM for Dolores. A look at the WRTH reveals Radio Dolores listed on 1480 kHz, so it seems that they are just part of the same company, Emisiones Platenses SA. Escande says that La Plata is a city of many public offices as it is the capital of Buenos Aires province. The city has a university and some 850.000 inhabitants. It is located some 50 kilometers southeast of Buenos Aires. Although La Plata is practically on the coast, it is not a coastal vacation resort like Mar del Plata much further away to the south.